There are four maintained paths to summits in Crater Lake National Park, but unlike the other three (Garfield Peak, Mount Scott, Watchman), the 3.2 mile route to Crater Peak does not offer any views of the lake - it starts a little way south of the crater rim, climbs to a wooded ridge and follows this further south, giving only brief glimpses of the wider surroundings. The last section ascends steeply to the rounded, 7,263 foot summit of the peak - an ancient shield volcano - which is mostly grassy and treeless, and affords better views, of valleys and other minor summits along the south edge of the national park, and across to the lowlands of the Wood River Valley. The relatively dry, shady conditions along most of the trail mean that wildflowers are limited, though there are several colorful species near the trailhead, where the path crosses the permanent stream of Vidae Creek. The route is not often hiked, so is a good choice for solitude. Crater Lake overview map, Crater Peak topographic map. The path to Crater Peak used to start along the Rim Drive as it crosses Vidae Ridge, 2.3 miles east of the junction with the south entrance road, but it now begins one mile further, a short distance along Grayback Road. This is mostly a narrow, unpaved, one way (east to west) route, but the western end is paved and two-way, leading to a picnic area, attractively situated between large conifer trees, close to Vidae Creek. A small ridge shields this place from the highway, so there is no traffic noise. The designated trailhead parking area has space for just three vehicles, as most people are here for picnics. 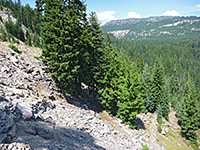 The Crater Peak Trail skirts the edge of the picnic area and passes a spring and small stream, typical of many in the forest just below the rim, fed by seepage from the lake. Just beyond is the larger drainage of Vidae Creek; both are lined by yellow and pink monkeyflowers, and several other flower species. The path continues through moist, shady terrain, climbing gently and arriving at the foot of a scree slope in a generally more open area, the land now sloping down more noticeably to the southeast, at the upper end of the wide valley of Sun Creek. The trail climbs the scree slope via two switchbacks, passes through another patch of scree, and comes to the top of Vidae Ridge, close to the original start point along the Rim Drive. The northern section of the ridge is narrow, around a location known as Tututni Pass, and the path hereabouts has views of steeply sloping ground on both sides, but the ridge widens to the south hence the land appears more uniformly flat. The route runs due south, descending slightly before becoming level, passing through flat, shady woods, and the surroundings are little changing for the next 2 miles, until an open grassy patch marking the start of the climb to the top of the peak, at the south end of the ridge. Tall trees return on the far side of the grassy clearing, though the lower slopes are free of undergrowth, becoming bushier towards the top, where the ground is composed of reddish ash. The trail curves round 180 degrees of the summit, approaching from the southwest, after gaining 600 feet in the last half mile. The top is flat for about a quarter of a mile; a very shallow, grassy basin, with two minor summits on the north and south sides. Trees grow around much of the edge so views are somewhat restricted, but there are plenty of gaps. 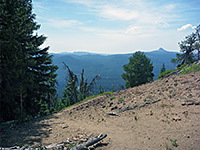 The distant scenery is similar in most directions - other wooded summits and large areas of forested land, the only difference being to the southeast, where the grasslands of Wood River Valley are visible. The trail circles all the summit, this part of the walk taking about ten minutes.